Access, the most popular database system in the world, just opened a new frontier in the Cloud. Access 2013 provides significant new features for building robust line-of-business solutions for web, client and integrated environments. This book was written by a team of Microsoft Access MVPs, with consulting and editing by Access experts, MVPs and members of the Microsoft Access team. It gives you the information and examples to expand your areas of expertise and immediately start to develop and upgrade projects. Shows you how to automate other programs using Macros, VBA, API calls and more. 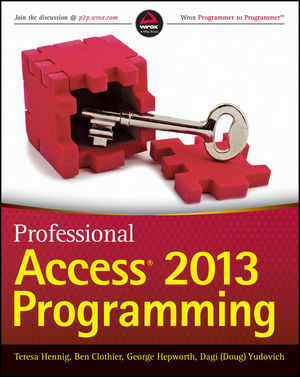 Professional Access 2013 Programming is a complete guide on the latest tools and techniques for building Access 2013 applications for both the web and the desktop so that developers and businesses can move forward with confidence. Whether you want to add expand your expertise with Client/Server deployments or start developing web apps, you will want this book as a companion and reference. Teresa Hennig, an Access MVP and business owner of 15 years, creates innovative and effective Access solutions for her clients. She is the president of two Access User Groups, the author of six books on Access, and an acclaimed presenter and trainer. Ben Clothier, an Access MVP since 2009, is an Access and SQL Server expert at the forefront of Access web apps. Ben is an administrator at UtterAccess. George Hepworth, an Access MVP, is an Access/SQL Server developer and consultant. He has written numerous books on Access and Access web apps, and is an administrator on UtterAccess. Dagi Yudovich, an Access MVP, develops Access SQL Server solutions to support BI needs. He is an administrator on UtterAccess.